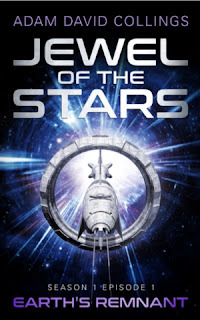 I was keen to read Jewel of the Stars, intrigued ever since the author Adam David Collings shared the concept. Jewel in the Stars: Earth's Remnant is a science- fiction novella. It is classic space opera - think transporters, faster-than-light ships, travelling between the stars, aliens and space ships. In this case, the action is set on a cruise ship travelling through space instead of on ocean and with planets, stars, and nebulae instead of islands or exotic ports. Apart the starliner Titanic in from the "Voyage of the Damned episode of Doctor Who (and yes, that starliner suffered a similar fate to it's namesake), I haven't come across this concept before. But what makes Jewel of the Stars particularly interesting is it's format. Earth's Remnant is the first 'episode' of the first 'season', much like the popular format of popular TV series. Each episode has it's own story arc, as does the season and the series. Adam has launched the series with episode one (and it's free prequel) - setting up the dramatic situation and premise. Jewel of the Stars sets out on a regular tourist trip when a cataclysmic alien invasion cuts them off from earth. They are on their own and most avoid the predatory aliens while surviving the scarcity of space. Can they do it? The first episode, Earth's Remnant introduces us to pivotal characters - the captain, an ex-space navy commander, an astroengineer and mother, the doctor and so on. The story presents a concrete dilemma that must be solved if the Jewel of the Stars and its passengers and crew are to survive. While Jewel of the Stars is written for the general market, I like how Adam subtly and naturally brings in a faith element to the story. I thoroughly enjoyed reading Earth's Remnant. The characters are interesting, with believable challenges and outcomes. The episode was well paced, with an exciting and nail-biting climax, leaving me anxious to read the next episode without feeling let down. I'm anticipating more great adventures and await the second episode with bated breath. Jewel of the Stars is for lovers of science-fiction - or anyone who have enjoyed Star Trek, SG1 or Doctor Who TV series. If you love an entertaining, fast paced read with great characters and dramatic situations set on a cruise ship in space, then this is the series for you. I'm not a big fantasy fan, but I love science fiction. Jewel of the Stars ticks all the boxes. I hadn't thought of the cruise ship as being a unique setting (compared to battlestars and exploratory science ships), but you're right: it is. Great review! Like you, I'm looking forward to the next episode. Great review, Jenny. I really enjoyed Jewel of the Stars. I'm a fan of the TV shows you mentioned. However, I think the themes are universal enough that people who don't usually read or watch sci-fi would still enjoy it. For example, there's a retired military commander who wishes he was still part of the action, and a Mum dealing with job loss and an autistic child. Yes there are transporters and tractor beams, but there's also human drama. Also I love the concept of doing a story as episodes in a series. Really looking forward to Episode 2.